Summer is when I seriously feel the need to eat more salad to beat the heat. 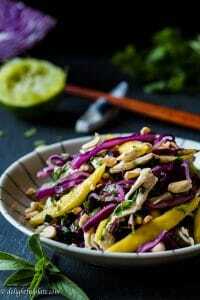 This cabbage-based salad with mango, shredded chicken and herbs is so refreshing and crunchy. It is also beautiful to look at with all the vibrant colors. This chicken cabbage mango salad has all the features of typical Vietnamese salads. In Vietnam, we usually make tasty salads by bringing contrasting flavors and textures into balanced harmony. You can read more about them in this Vietnamese rare beef in lime juice salad post. I use chicken breast in this recipe, but please feel free to use thigh or drumstick. Chicken is poached with ginger, shallot and fish sauce to remove poultry odor as well as to make it more flavorful. Red cabbage is crunchier than green cabbage. I choose to use red cabbage mainly because its dark purple color together with yellow (from mango) and green (from herbs) create such an eye-pleasing visual effect. I like to add some salt to shredded red cabbage before mixing it with other ingredients to remove some of its excess water. I somehow find the blue liquid from red cabbage looks a little weird and… disturbing. If you don’t like red cabbage, I think it’s fine to use green cabbage. You will still need to salt the green cabbage, let it sit for 5-10 minutes and then squeeze out excess water. 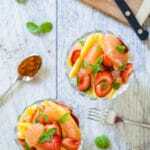 Mango is another essential ingredient in this recipe. It is best to use unripe/near-ripe mangoes because they are firmer and not overly sweet. Some tartness from unripe mangoes also adds interesting tang to the dish. In Vietnam, the best herb to use in a chicken salad is Vietnamese coriander (rau ram). Its flavor/aroma is cilantro-like and more lemony and peppery than cilantro. I heard that this herb can cause some side effects if we eat it too frequently. I cannot find rau ram where I live, and I’m not sure about its availability in other places in the U.S. and other countries. However, cilantro, mint and Thai basil are more than capable of brightening this salad and making me happy. 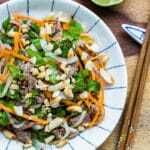 Another Vietnamese salad you may want to try is Vietnamese Beef Noodle Salad (Bun Bo Xao). It is also very refreshing and healthy. 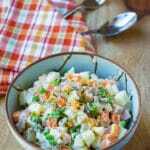 Chicken cabbage mango salad is so refreshing and crunchy with contrasting flavors and textures. It is a beautiful salad with vibrant colors and it tastes as great as it looks. Place chicken breast in a pot and add enough water to cover it. Add ginger, shallot, 1/2 teaspoon of salt, 1/2 teaspoon of fish sauce. Bring to a boil, then reduce to low heat. Cover and simmer until chicken is cooked through, about 15 minutes. When chicken breast is fully cooked, transfer to an ice bath to stop cooking. Once it's cool, shred the chicken, put in a clean mixing bowl. While chicken is being cooked, place shredded cabbage in a colander and add 1/4 teaspoon of salt. Let stand for 5-10 minutes then drain, put in the mixing bowl. Peel and cut mango into thin strips. Place in the mixing bowl. Add mint, cilantro and Thai basil to the mixing bowl. Whisk together lime juice, sugar and the remaining fish sauce. Add the dressing and mix well to combine. It's best to taste as you add the dressing and adjust to taste. Transfer to a serving plate, add crushed roasted peanuts and enjoy. If you don't want the red cabbage to be too crunchy, you can add the dressing to the cabbage only, mix and let it sit for 5-10 minutes before adding remaining ingredients. It will become softer. 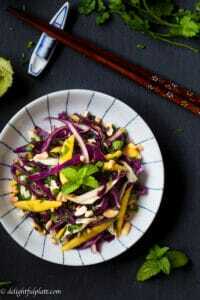 I love the SE Asian flavours in this gorgeous salad. I like to use red cabbage in salads and slaws, too. It adds so much flavour . . . and nutrition! Beautiful recipe! Hi, Elaine! Yes, I think the best way to eat red cabbage is to throw it in salads and slaws. Thank you for stopping by! Look at those colors! This salad looks stunning! I love the asian and fruity flair in there! YUM! Thank you for your comment! I hope you will give it a try. Love the flavours and the colour in this dish. We are just getting into eating mango, and I happen to have one that is ripe and ready to use. This looks like a great place for it. Hi, Gloria! Thank you for your comment! It’s actually better to use unripe/near-ripe mango in this recipe since it is easier to handle. I also made it before with ripe mango and it tastes great too, however you need to be more careful when slicing and mixing. I love Vietnamese kitchen with its unique flavors and colors. Btw my parents just got back from Vietnam, they are so in love…(they live in Russia where we don’t have much fresh herbs and absolutely no exotic fruits like mango). Great recipe! Hi, Tatiana! It’s great to know that your parents travelled to Vietnam and loved the trip. I don’t know that you don’t have mango in Russia. I hope they tried and enjoyed Vietnamese food when they were there. I think fried/baked tofu will work great too. I agree, mango can be surprisingly delicious in many savory dishes :). 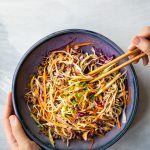 I just love raw cabbage dishes that aren’t traditional coleslaw (although I love that too). This sounds so refreshing and crunchy and has that sweet and savory that I love. This sounds refreshing and perfect for the hot weather we have in AZ! What an absolutely gorgeous salad! I love finding ways to use red cabbage. It is such an underrated vegetable, yet so good for you. I LOVE the colors in this dish. Your photos are beautiful!